OPDR has revised three of its established services connecting Morocco with Northern Europe and Russia: AGAX, DUNKRUS and CISS. Just in time for the Moroccan citrus export season, the services meet the increased demand and offer optimized rotations with best transit times. The revised services provide excellent opportunities for fast and reliable shipments of Moroccan export products in reefer containers to the strategic consumption areas in Northern Europe and Russia. With a total of four weekly departures from Morocco, the services excellently connect the northwest African state with a broad variety of European countries: Spain (including the Canary Islands), Germany, France, Belgium, Netherlands, England and Russia (CTSP and Bronka). The combined services AGAX and DUNKRUS have been extended by additional calls in Agadir, Tangier Med and Saint Petersburg, offering a direct link from Morocco’s main ports for the export of agricultural products to Russia – the biggest consumer market for citrus fruits – in only ten days. On their way to the Baltic region the six deployed vessels, which are equipped with an adequate amount of reefer plugs, make a stopover in Rotterdam after only 4.5 days. The Container Terminal Saint Petersburg (CTSP) is reached only five days later. 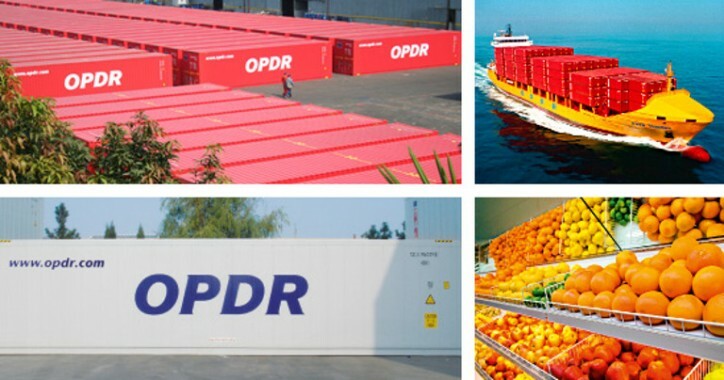 Moreover, OPDR offers a weekly service between Morocco, the Canary Islands and Northern Europe: The CISS service connects Agadir and Casablanca with Hamburg, Rotterdam and the United Kingdom (Tilbury) with stopovers in Tenerife, Las Palmas and the Iberian Peninsula, giving customers a wide range of opportunities for reefer shipments from the fruit-rich subtropical regions to northwest Europe. All services are equipped with state-of-the-art reefer equipment, allowing secure and reliable transportation of perishable products. In terms of capacity, the deployed containers also live up to OPDR’s standards: 40ft and 45ft pallet wide high cube reefers provide an increased cargo intake for the customers.